These Crisps were thin and crispy and each early bite was of a similar consistency, but they crumbled to mush very quickly. These Crisps were particularly thin in appearance. There were oil boils, some large some smaller and most were intact. Despite being described as Barbecue flavour, the coating was a gentle orange, which was somewhat surprising. A Nose Plunge Test revealed a mild sweet aroma that included a touch of unidentifiable seasoning. 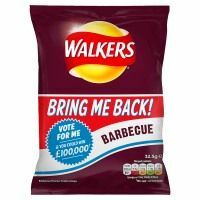 Barbecue is a very popular flavour in the US, but perhaps a little surprisingly, not so much in the UK. To compare, we would obviously look for those American cousins, and in this case, they were found wanting. There was flavour, but it was very mild and muted. There was a little sweetness, but nothing remotely smoky.